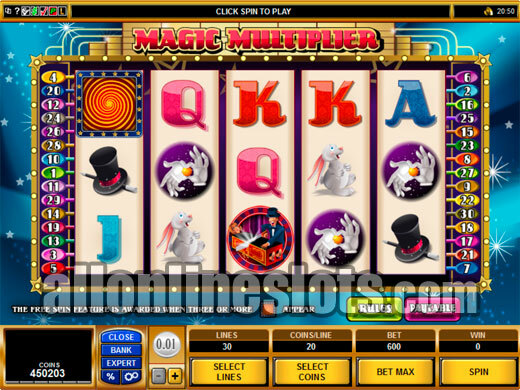 Magic Multiplier is a Microgaming video slot with three different bonus games and the gamble option. Top line win is 10,000 coins and you can bet up to 20 coins per line. Win big on the Cups Bonus, The Curtain Bonus and the free spins. 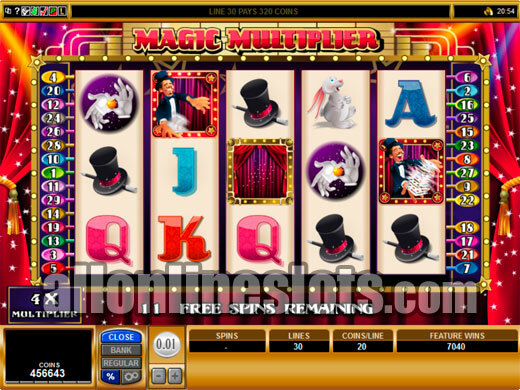 The world of magicians is brought to life with the Magic Multiplier slot machine from Microgaming. 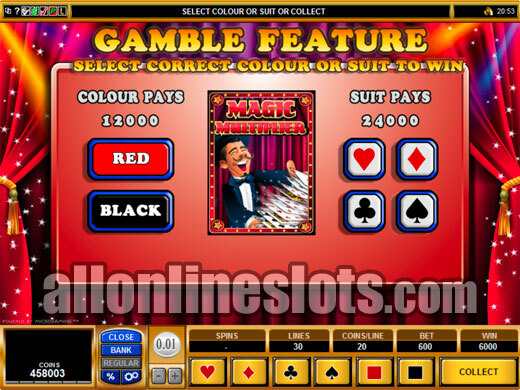 The game uses the 5 reel, 30 line format and as the name suggest's has a magic theme. Magic Multiplier has three bonus features and gives you the option to gamble your wins with an Australian style double up. 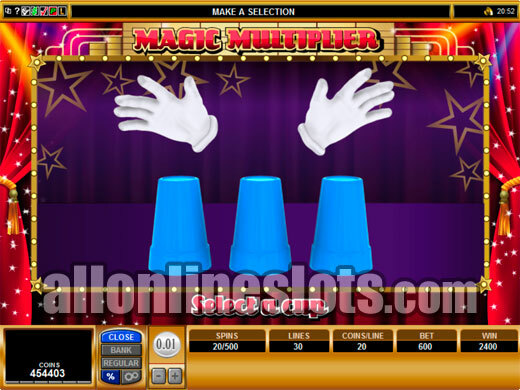 You have a lot of betting options with Magic Multiplier. You can choose from coin sizes ranging from 1 cent to 10 cents and choose to bet between 1 and 20 coins per pay line. This gives a max bet of 600 coins and a max bet range of between $6 and $60. You can play less than max bet and not miss out on any of the games three features. The Magician symbol is the highest paying symbol with five of a kind paying a big 10,000 coins per coin bet or 200,000 coins at max bet. The Magician symbol is wild and substitutes for everything but the bonus symbols. After the top pay there is a big drop to the nest highest line pay with five magic tricks and five hands paying just 250 coins. From there the five of a kind pays drop to between 200 and 100 coins. This means that to hit big on Magic Multiplier you need to either hit the top pay or one of the bonus features. Speaking of bonus games let's take a look at the three bonuses. The first bonus is the Curtain Feature. This is won by getting three curtain symbols anywhere on the middle three reels. Once activated you get to pick one to reveal you bonus prize. You can also get a second pick randomly. The second feature is the Cups Feature. This bonus is won by getting the Cup symbols in any position on reels 3, 4 and 5. Once activated you move to a second screen stage where you have the classic cups game where a ball is placed under one cup and you have to guess where the ball is. There are three rounds in the Cup Bonus so you get a good chance of winning big. If you guess the cup where the ball is you win a bonus prize up to 25X your total bet. If you guess incorrectly you get a consolation prize of 2X your bet. The final bonus on Magic Multiplier is the free spins bonus. This is won by getting three or more scattered Wheel symbols. The amount of free spins you win is random and you are awarded a random multiplier of between 1X and 5X for all of the free spins. The free games can be re-triggered and both the Cups and Curtain bonuses can be won during the free games. Clearly the free spins offer the chance at the games highest possible jackpot with five Magicians paying 1,000,000 coins if you hit the win on a free spin with the maximum X5 multiplier. 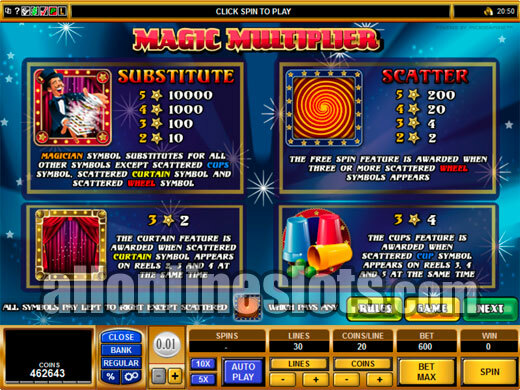 Overall, Magic Multiplier offers a good amount of features to keep things interesting although the really big pays are reserved for the top jackpot and the free spins. In the end another solid video slot machine from Microgaming.